Have you just gotten engaged? Congratulations, what an exciting time! After you’ve let your family and best friends know the wonderful news, you might want to get creative in how you announce your engagement to everybody else in your life! You can simply tell everyone the big news, of course, but we love the idea of getting more creative. Here are some super ideas for perfect engagement announcements! Oh my, this is my absolute favorite engagement announcement on Instagram: a couples’ hands shown literally tying a huge knot, with the fiancée’s hand displaying a brand new engagement ring. Perfection! Keep It Simple… With Signage! A smiling couple, each holding a framed chalkboard sign: hers says “She said” and his says “Yes”. And both are grinning ear to ear! Simply awesome! So many different ways to announce your engagement with a Scrabble board. You can spell it out in a crossword, or get creative with words and your beautiful new ring! The choice is yours! Seriously, is there anything more romantic than a shot of the happy couple kissing, holding balloons with their wedding date written on them? I don’t think so! Such a sweet gift from one good friend to another! Thank you, @graceannasmom for giving me such beautiful signs to create! Now that you've given @stephimb123 her gift, I can list this in my shop! 😉 Link to shop in bio. A simple close-up of a calendar, with your gorgeous engagement ring used to circle your wedding date? Um, YES! This is one of my favorite engagement announcements! If you’re lucky enough to live near a beach, why not use it to write an engagement message in the sand? Have a look! Getting engaged is wonderfully exciting news, and should be shared in a way that speaks to you as a couple. Engagement announcements can be as simple or as complex as your own personal style mixed with some creativity! 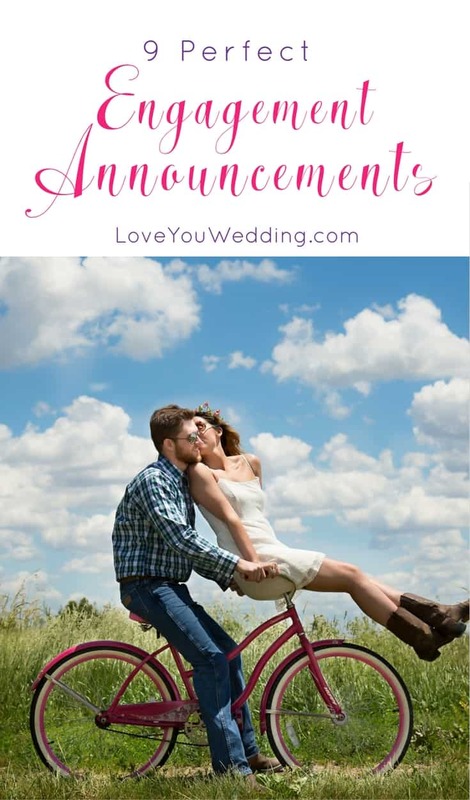 I hope you enjoyed my ideas for engagement announcements! How did you announce yours?